This is my truth as I remember it: Anyone within the TDG Slack channels were subjected to my vociferous and – quite often – over the top declarations that Chris Sale was a dead man walking. Often, I was pitted against another cantankerous individual who felt I had no idea what I was talking about (often true) and would argue the opposite side. Injured players – especially those who are great and provide a level of enjoyment to the game we love – are nothing to take a victory lap on and I won’t do it here. His multiple DL stints for old man aches after nearly a decade of body contortion and productivity should have been expected. Like most players, Sale is in the fight of his life against Father Time. Smart money says he loses eventually. Diminished velocity last year, the aforementioned DL stints, a league proselytizing The Reliever Way, and a player entering his age-30 season all seem like a recipe for the “his best days are behind him” narrative. 237 strikeouts over 158 innings. A 2.11 ERA and a .86 WHIP. A league leader in hard-hit rate (26.8%) and barreled ball/PA (3.8%). For statistical comparison, it was Sale and Noah Syndergaard when it came to inundating batters with sheer force and stuff. Chris Sale is still good, y’all. If you haven’t read the news and need to feel a little more maddened, two things happened to Chris Sale so far this year. First, a reported diminished velocity reading during spring training has alarmists already wringing their hands. Second, the Red Sox signed Sale to a mind-numbingly large extension for big money. A word of caution for both sides. Spring training velocity readings usually mean zilch. It’s the opposite narrative of “the best shape of his life”. Often, it amounts to nothing. Pitchers – especially ones that were throwing in October – take longer to regain some form because their offseason was, well, off. Now, the Red Sox – particularly Dave Dombrowski – have had a pretty decent record of locking in strong starting pitchers to big money. Sometimes it works and sometimes it doesn’t. I would not take the extension as a sign off that Sale is completely healthy and last year was merely a blip on the radar. 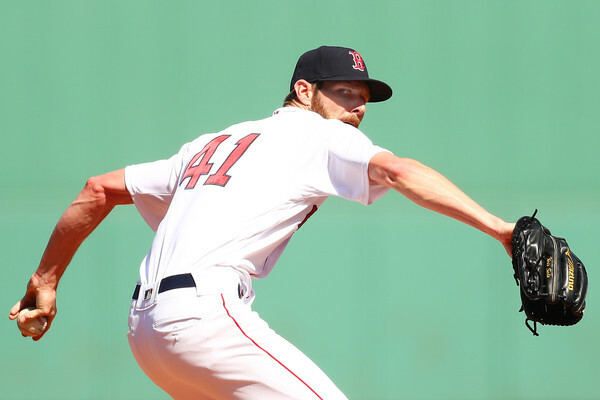 For this season, I expect Sale to finish with about 170 innings, an IL stint that is largely for maintenance purposes but will cause entirely too much speculation, and the elite numbers he’s always put up (ie 11 K/9, microscopic WHIP, plenty of W/QS). Again, Chris Sale is still good. For my money, Chris Sale is trending in the direction of Clayton Kershaw. Absolutely incredible and a complete joy to watch…when he pitches. Therein lies the conundrum for all fantasy owners as the seismic shift in pitching philosophy takes hold. Do I want quality and limited quantity? Do I want to seek out a younger pitcher who could get the quantity over an old vet who will inevitably breakdown? Over the course of the regular season, how often will we get 200+ IP out of Sale from now on? Does Sale really need 200 IP to wind up as a top 5 pitcher? Like I would recommend for most pitchers in this situation (e.g. Max Scherzer, Clayton Kershaw, Justin Verlander, Madison Bumgarner), these arms are only worth it if you’re in your window. Valuing elite arms 3 years at a time is best practice in dynasty leagues. They break down, they fall off dirt bikes, and sometimes they require a ligament from their knee to be placed in their elbow. You know, normal things. In other words, I would not be surprised if Sale was still #1 or #9 in our top SP rankings for 2020. In conclusion, Chris Sale is still good. At least for the moment. Signed in 2013 as an international amateur, the then fourteen-year-old was seen similar to the way he’s seen today. A raw kid with unharnessed talent, a strong arm, and good range to stick at third base. An aggressive hitter who was confident in his ability to do damage against talent that was much older than him. Devers has been considered a future middle of the order bat since he was drafted, but hasn’t quite hit the ground running. He’s been rushed developmentally. and now is in the process of learning at the Major League level. Last season wasn’t exactly the breakout most of us had in mind for the roly-poly Red Sox third baseman. What we touched on earlier, about being aggressive? Yeah, he was a bit too aggressive. Pitchers made him flail by throwing up and out of the zone with fastballs, and getting him to chase on offspeed/breaking pitches as well. He managed to regain his patience on fastballs towards the end of the year. Yet I’ve seen the pitches that make him take some ugly swings this spring. The results in 2018 was a strikeout rate of 24.7%, while posting below league average contact as well, and only seeing 3.73 pitches-per-plate appearance. This kid needs to develop some patience at the plate or increase his rate of contact. The power that was promised was there though, as Devers hit as many round-trippers as he had years on the planet earth (21). He also posted an ISO near .200, an exit velocity 3MPH better than average, and barreling up 9.1% of the pitches he saw. While the amount of contact he made may have been limited, he certainly made it count when he connected. This Kid’s got that all fields kind of power. The patience at the plate still looks to be an issue this spring, as Devers has yet to accept a free pass. Thus, giving him the elusive same OBP as BA (.390/.390). There’s a lot of talk about Devers taking instruction from coaches well, and even some chatter about having him bat third in the order. My guess is that is an experiment that won’t last the entirety of the season. Devers’ plate discipline continues to be an issue, and until he starts having better at-bats I’m not buying into the hype. The good news is that Devers is still plenty strong. I’m confident that Devers owns a 30-homer bat, but less confident that he’ll be hitting that many dingers in 2019. Likely, we’ll see his power take a step forward to the mid-twenty range, but he has neither the exit velo, nor the launch angle, to produce for dominant power numbers, yet. We’ll see what kind of tweaks he’s made once the Statcast data starts coming in for 2019, but last year his launch angle was essentially league average. 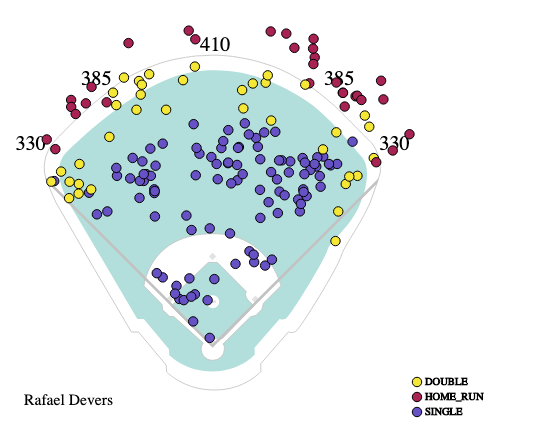 Devers also plays in a home park that represses lefty power. I believe he’ll develop the kind of power to overcome the park and launch angle, but not in 2019. 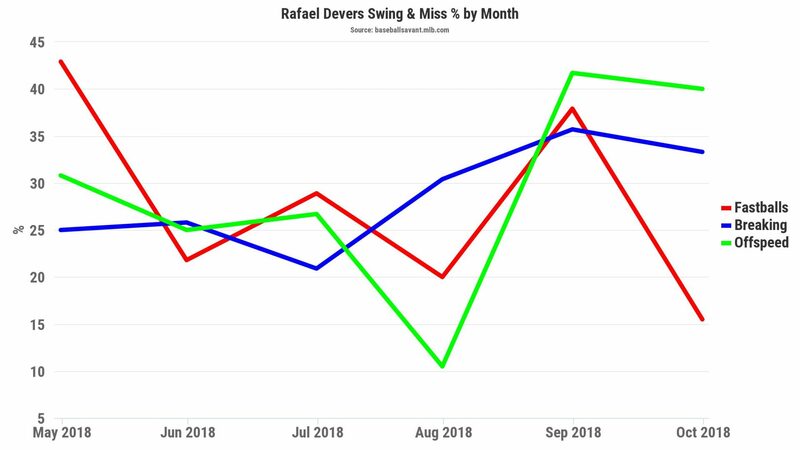 In 2019 I expect more bumps in the road as Devers continues to grow in the MLB. Likely to slash something like .260/.300/.400 with mid-twenties pop. He’ll collect plenty of runs and RBI in the potent Red Sox lineup. Nothing that screams incredible dynasty asset, but at age 22 he still kind of is. 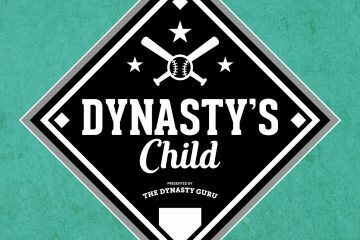 The window for buying Devers in dynasty has opened. 2018’s let-down of a season and his aggressive nature at the plate have owners worrying about the Red Sox third baseman. Now I’m not implying he’s ever going to be a force in OBP leagues. Still he should walk at a league average clip, and TDG’s own Jordan Rosenblum recently predicted that Devers will get his strikeout rate below 21%. He also predicted a .250 ISO! I agree that we’ll see positive growth in both these areas of Devers’ game, but less sure about the level of success he’ll achieve in 2019. Still, I do think that Jordan’s prediction is Devers’ eventual endpoint. He’s going to be a valuable asset in all formats and should be treated as such. Price checking Devers now or in-season is something I would encourage. Buy low before the window on Devers closes. The third round pick for the Red Sox in 2018, Feltman had a chance to follow in Brandon Finnegan’s footsteps, going from drafted to World Series in the same year. Feltman’s stuff when drafted was already polished enough to face major league at-bats but ultimately the Red Sox decided to keep Feltman in the minors and space out his outings due to the accumulation of innings. In his final season at TCU, Feltman racked up 17 saves in 20 opportunities, tied for the lead in all of Division 1. He appeared in a total of 29 games and turned in 21 of those scoreless. Feltman has a terrific 2 pitch mix, touting a 70-grade fastball and a 60-grade slider. A combo he used to generate a 13.88 K/9 in his 23.1 innings in the minors in 2018. His fastball regularly sits in the 95-97 range and tops out at 99 with a decent amount of run. His delivery adds deception out of his hand giving batters more difficulty picking it up towards the plate. His fastball is complemented by a mid 80’s wipeout slider that is a true out pitch. The combo of them together gives him one of the best 2 pitch combos in the minors. Feltman’s Delivery is an aggressive one, but he uses his lower half really well to generate power on his pitches. There’s a noticeable effort in it but it doesn’t take away from his command as he’s never had issues with walks at any level. Let’s face it, even though the Red Sox won the World Series last year and are bringing back most of the same roster, the bullpen has some major questions. The biggest question mark for Boston going into the playoffs last season was also the bullpen. Apart from Kimbrel, there was no certainty at any other point for the Red Sox, most notably inconsistency with the 8th inning man. That 8th inning spot was mostly manned by now-closer Matt Barnes, but Barnes struggled at times and Joe Kelly (and his Great Stuff) took some turns there as well. Now the acting closer, the 7th and 8th inning bridge roles are once again up for grabs. Currently being held down by Ryan Brasier (A 31-year-old rookie), there still remains a bunch of questions for the Red Sox bullpen. In the playoffs last season, the bullpen was unreal, but it took until the playoffs to turn that on. Until the ‘pen shows consistency across the regular season it’s still going to be a point of discussion. Feltman was invited to Spring Training this year and made three appearances totaling 5 strikeouts, 3 walks and 1 hit over 2.2 innings pitched. Given the state of the Red Sox bullpen at the moment, it’s not out of the realm of possibility that by the end of the year he’s being used in high leverage situations. At the very least he should be in Boston being used in some sort of relief role. Drafted to be the closer of the future it won’t be long until Feltman is doing just that at the major league level whether its by the end of 2019 or for 2020.